Trying to follow a heart-friendly diet, but always thinking about chatpati, chutneys, creamy sauces and dips? Why only think? Why not relish it right away? We are not joking! Following a heart-y diet does not mean compromising on taste. With a few healthy twists, you can still enjoy your favourite accompaniments. Here is a tongue-tickling selection of chutneys, dips and sauces. Tasty accompaniment for rotis include Carrot Garlic Chutney, where garlic is a functional food which helps in reducing cholesterol levels and raised blood pressure. Mint and Onion Chutney, made using natural ingredients that help to protect your heart as mint and coriander provide vitamin C and vitamin A which are potent antioxidants. A healthier low fat version of garlic chutney is Fresh Garlic Chutney to pep up your healthy snacks and decrease blood pressure and cholesterol levels. Raitas are an irreplaceable part of Indian meals. And can be made healthy by avoiding ingredients like boondi and fatty seasonings. 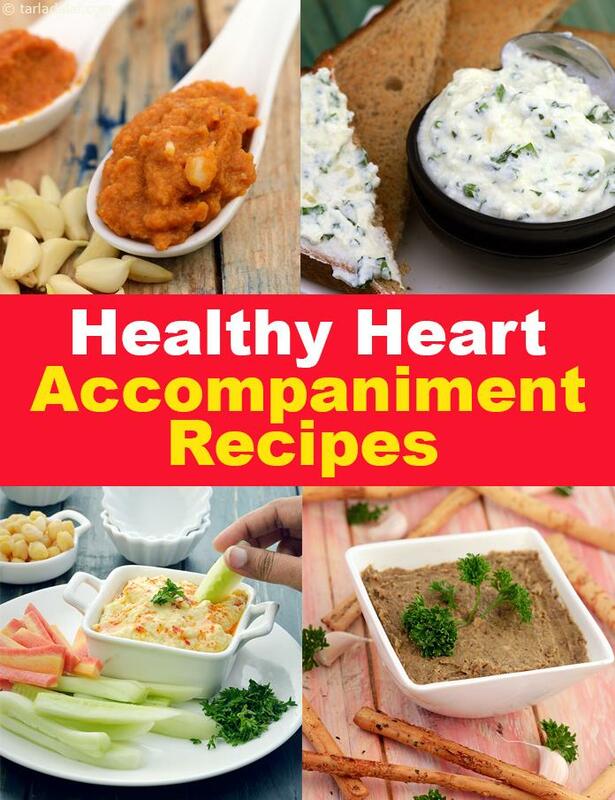 One can replace full fat curds with low fat curds to support heart health. Lauki Phudina Raita is a tasty heart friendly recipe that will be loved by all age-groups. Carrot and Beetroot Raita is a great way to add antioxidants to your diet which protect the heart. You can also add some omega-3 fats to your accompaniment like Flaxseed Raita which helps to build immunity and protect heart health. Garlicky Hummus is an amazing Mediterranean dip which also adds some amount of protein to your meal due to the presence of kabuli chana and curds. Try your hands on Parsley Yogurt Spread to make healthy toasts or spread it over a whole grain paratha for your children. A unique way to add colorful vegetables to your diet is by putting them into spreads and dip like we have made this delicious Chunky Vegetable Spread a spread loaded with healthy vegetables like carrot, capsicum and cucumber. This delicious herb-flavoured spread is made by combining cottage cheese with yoghurt, parsley and dill which can be served as a healthy spread on whole wheat bread toasts for breakfast.